When the architecture of Tuscany meets the big open sky of Texas, it's a recipe for magic. 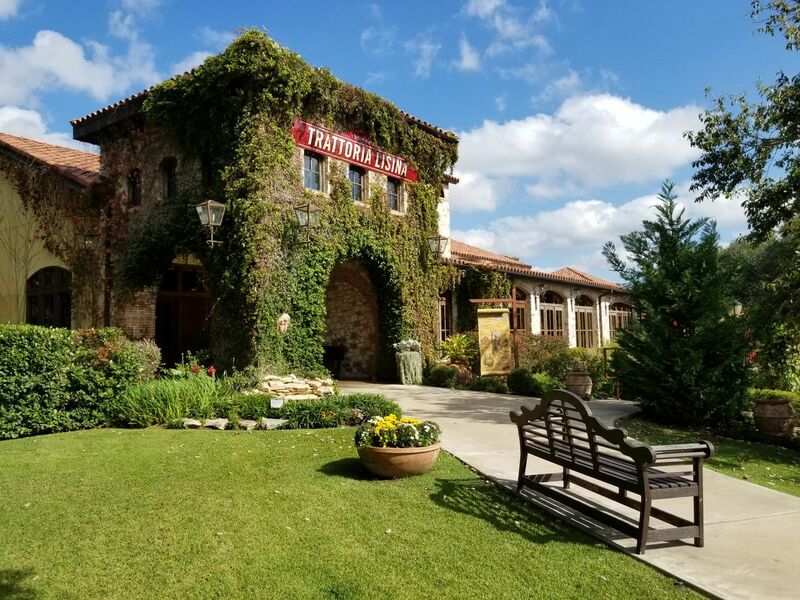 Let's explore Trattoria Lisina, a renowned authentic Italian restaurant and rustic wedding venue in the hills of Driftwood, Texas. Our upscale Italian restaurant is situated amid a 20-acre vineyard, which itself is nestled amid the rolling splendor of the Texas Hill Country. When you arrive, you'll see a walkway beckoning you. Wandering through gardens that burst with pink and yellow flowers, ends at the front door of our majestic, ivy-covered stone building. Among the handsome shrubs and oak trees, a circular fountain makes for a perfect place to meet your party and take pictures for social media. You might be tempted to toss a coin into the clear blue water. Climb a few stairs near the fountain, step under the imposing archway, and head through the front door. You'll find yourself admiring a gleaming white marble bar in front of an elegant mirror. This is a warm, cozy space to relax with a refreshing drink or two. Through an interior archway is our main banquet room. Throughout this warm and cozy space, sconces and chandeliers provide alluring points of light. The walls, meanwhile, are adorned with antique plates and pictures of Tuscany's culinary treats. When you're standing in the center of this dining area, the open kitchen is to your left. It's fun to watch brilliant chefs preparing authentic Italian food and beverages. Above the kitchen, a long mural depicts an idyllic Tuscan vineyard. Beneath it, artifacts reminiscent of Tuscany sit on a shelf. They include baskets, jugs, sunflowers, and bunches of grapes — artificial grapes, of course. Opposite the kitchen is a lovely white fireplace with candles inside it and jugs on top of it. Beside it, several small barrels are attached to the wall; they bring the annual grape harvest to mind. This room contains several doorways that will take you into the second banquet room, a long enclosed veranda. This veranda has lots of seating, but it can be partitioned if you have a small group. Its stone walls boast decorative plates, and stunning wooden cabinets stand at each end. A highlight is the second white fireplace, which includes a niche for firewood. The main attractions of this room, though, are the tall windows that offer entrancing views of the vineyard, the surrounding hills, and the lush vegetation. In the end, no description can quite do our Italian restaurant and event venue justice. You have to see Trattoria Lisina for yourself. Toast your friends and loved ones amid all the homey decor and furnishings. Indeed, spend just a few minutes at this restaurant, and you'll be completely enchanted by the beauty, the charm, and the cuisine of central Italy.